A German company that initially made their mark in the auto-electronics sector though their strong, robust lighting solutions that are ideal for off roading, Hella have since broadened their horizons to create more products for a global market, such as Hella Horns. Read on to learn more about our two favourite models from Hella Horns, which offer exciting, affordable advancements in horn technology, no matter what kind of driver you are! Meet the Hella Supertones and Hella Sharp Tone. Hmm, it sounds like your horn is not quite working as you’d like too – is it too quiet? The pitch all wrong? Or does it not add anything to your car looks wise? You have come to the right place to find your solution, delivered in the form of the attractive, hardy, loud, affordable, and universal Hella Supertones and Hella Sharp Tone horns. Your command of the road is just a Hella Horns kit away! How are these loud horns even legal, you may ask? Don’t worry, both the Hella Sharp Tone Horn and Hella Supertones are ECE approved and safe for performance cars, off roading, and your everyday driver. Why Upgrade to a Horn that’s Manufactured by Hella Horns? It’s simple – to be heard. 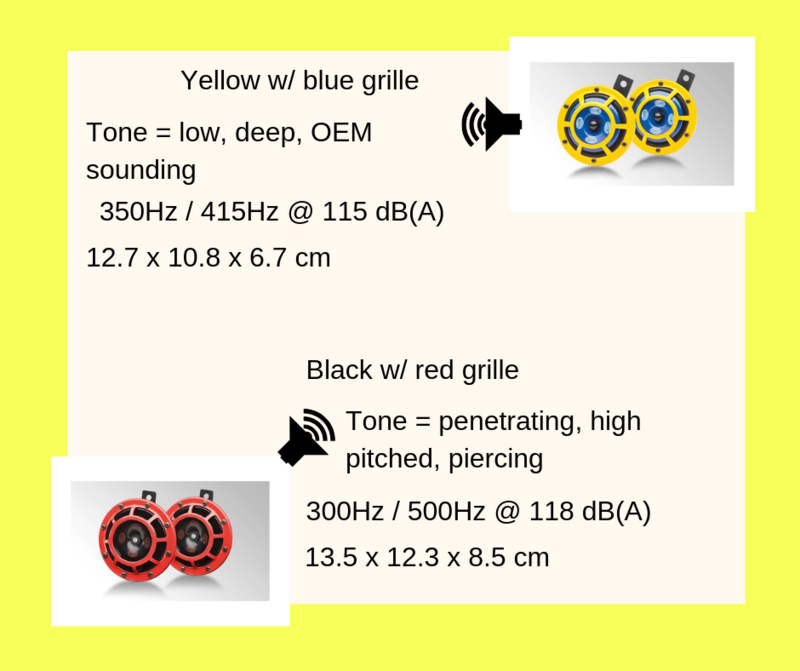 Though, the epic, fierce-looking grill and bright yellow/blue and black/red tones are also massive selling points and will add a robust, sporty look to any car – whether it’s performance, 4x4, or your everyday vehicle. Being able to withstand off-road use, the Hella Supertones and Hella Sharp Tone horns are ideal for tough conditions. The penetrating tone of these Hella Horns mean you won’t be left unheard on the road, making each car ride safer and more reliable, thanks to your Hella Supertones or Hella Sharp Tone. Although strikingly different in size and presentation, the Hella Sharp Tone and Hella Supertones have similar specs and are OE disc horn upgrades that will give you a loud, penetrating tone. Each of these Hella Horns can handle Aussie road conditions, thanks to their corrosion-protected grilles and IPX4K splash-proof ratings. They’re not only made for great sound, but to last! The Hella Sharp Tones is perfect for small cars, saloons, agricultural machinery, and forklift trucks, while the Hella Supertones suits larger vehicles, such as buses, trucks, and emergency vehicles, as well as your off-road and passenger cars. This isn’t to say that these Hella Horns aren’t interchangeable options between these vehicles – they’re both universal products. The Hella Supertones has some additional add-ons: rubber grommets for additional protection against water, a melody function, and a Teflon pill for humidity protection – Hella Horns has definitely created the perfect horn for off-roading. Still undecided? 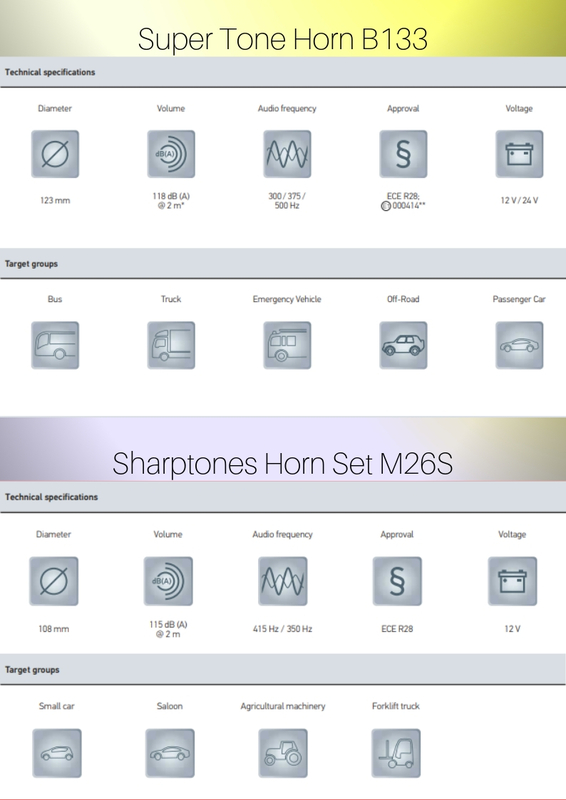 Check out the Hella horns app and listen to the different horns in their range for free!